Discussion in 'Model 3' started by 1208, Mar 29, 2016. 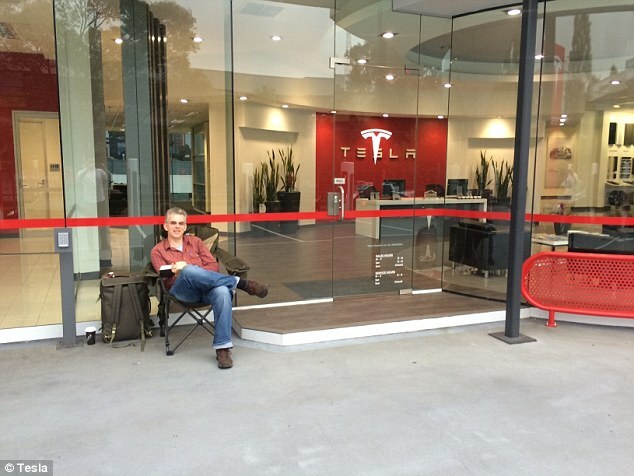 I read the employees took him for a ride (his first ever) in a Model S. Would've been funny if someone swung by and snagged his spot while he was driving around..
Just a regular guy trying to be part of history. I, too, hope to be part of something noteworthy and special. I've never heard of anyone camping out to pre-order a car, but I'll be one of the first when I arrive with my sleeping bag, pillow, and snacks after work on Wednesday. Should be fun.